Maintaining the family car makes it safer and more dependable, but it also makes it “greener” on the road. To mark National Car Care Month, Amica Insurance is sharing the following tips from the Car Care Council to help improve your car’s gas mileage and protect the environment. To mark National Car Care Month, Amica Insurance is sharing tips from the Car Care Council to help improve your car’s gas mileage and protect the environment. Keep the car properly tuned for optimum performance: Regular engine performance maintenance will help burn less gas, pollute less and prevent future car trouble. Regularly check and replace dirty air filters: Replacing a clogged air filter will improve the car’s performance and acceleration. 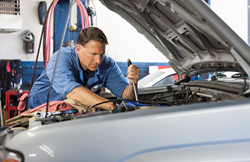 Have spark plugs checked and replaced, if necessary: A dirty spark plug also causes misfiring, which wastes fuel. Maintain the cooling system: A cooling system thermostat that causes the engine to run too cold will lower the fuel efficiency of the car. Check tires monthly: Proper tire pressure can improve gas mileage by 3.3 percent or 10 cents per gallon. Use the correct motor oil: You can improve gas mileage by 1 to 2 percent. Look for oil that says “energy conserving.” The oil and oil filter should be changed every 3,000 to 5,000 miles, or as recommended in the owner’s manual. Check gas caps: A loose, cracked or damaged gas cap allows gas to escape from the tank as vapor, wasting fuel and increasing vehicle emissions. Inspect the A/C: Have the air conditioning system inspected annually by a technician, who will check the pressures to test operation, refrigerant charge and outlet temperatures. Maintain the vehicle fuel system: Replace the car’s fuel filter every two years or 24,000 miles, and have fuel injectors flushed every 30,000 miles for a cleaner, “greener” car that will save money at the pump. Amica Mutual Insurance Co., the nation’s oldest mutual insurer of automobiles, was founded in 1907. The company, based in Lincoln, Rhode Island, is a national writer of auto, home, marine and umbrella insurance. Life coverage is available through Amica Life Insurance Company, a wholly owned subsidiary. Amica employs more than 3,700 people in 44 offices across the country. For more information, visit Amica.com.